BeenThere-DoneThat: The Essex Coast and Marshes. The rector of East Mersea in 1880 wrote "A more desolate region can scarce be conceived and yet it is not without beauty". This scene is near the village of Salcott. 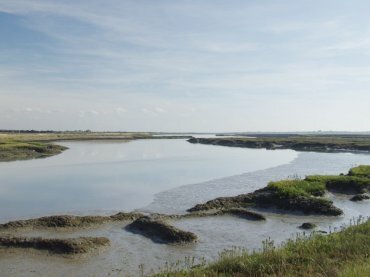 The Essex Marshes are to be found all along the Essex coast from the River Thames in the south, at the border with Greater London, to the River Stour and Harwich in the north on the border with Suffolk. Essex has the longest coastline of any English county. A straight line drawn parallel to the coast from the Thames in the south to the Stour in the north is about 50 miles in length but follow the convolutions of the coastline and you will cover nearer 400 miles. The Essex Marshes at Tollesbury. The marshes with their multitude of inlets are usually very popular boating areas. Tollesbury, for example, has it's own marina. 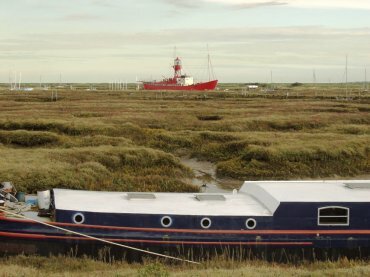 The red lightship 'Trinity' is not as it might appear, stranded in the middle of the marshes but is moored at the edge of the main channel which gives access to the marina. The Essex Marshes at Mersea Island. 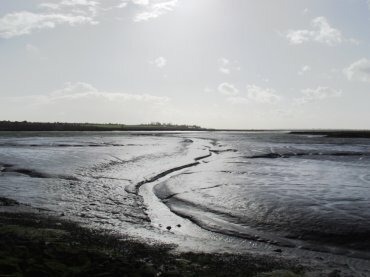 This is the main channel, at low tide, through the marshes that separate Mersea Island from the mainland. Low tide exposes a large expanse of mud flats which are essential to the many wading birds found in the marshes. If you like solitude or bird watching then you can find them in the Essex marshes and there is nothing more atmospheric than the haunting cry of a Curlew floating over a seemingly empty marsh. 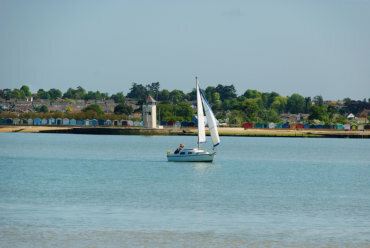 This is a view of Brightlingsea from near East Mersea on Mersea Island showing Bateman's Tower just to the left of the sailing yacht.